Wikipedia has about 4,668 articles it considers to be “highest quality.” Of these, only 12 relate to languages or linguistics. That means that many linguists, theorists, and theories aren’t well-documented on Wikipedia, and may even be missing completely. Likewise, many dialects and languages have articles that could be improved. That’s part of what drove Wiki Ed’s partnership with the Linguistics Society of America. By connecting linguistics students to Wikipedia, students are critically engaging with information about languages, dialects, and linguistics. They can read through the information on Wikipedia, critically assess it, and then set out to improve its content. They develop greater confidence in their own understanding while improving a reference resource used by millions of people. We’ve seen some incredible results. Students in linguistics have improved articles such as the Cahuilla language of Southern California, Ho-chunk, the Wisconsin German dialect, and concepts such as language convergence. To help advance this partnership even further, we’ve created a new subject-specific guidebook for students, Editing Wikipedia Articles on Linguistics. The guide was written with input from Gretchen McCulloch and Wikipedia editors User:Cnilep, User:Uanfala, and our own Wikipedia Content Expert in Humanities, Adam Hyland. 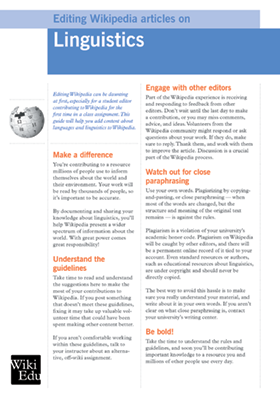 It takes student editors through the process of writing or improving Wikipedia articles, with templates for structuring articles on languages, dialects, and linguistic concepts. It also steers students through tricky subjects such as identifying reliable sources in linguistics, or structuring a language InfoBox. You can browse through the guide yourself as a .PDF file. Instructors participating in our Classroom Program can also receive free printed copies for their students. This guide joins a suite of online training materials we’re making available to students as part of our Year of Science. We’re still accepting new classes for the fall term! Let us know if you’d like to bring an exciting service learning and public communications element to your linguistics assignments by reaching out to contact@wikiedu.org. Photo: Touching Rosetta by Tom Stohlman, CC-BY-SA 2.0 via Flickr.